For the SNES game, see Castlevania: Dracula X.
Castlevania: Rondo of Blood (悪魔城ドラキュラ X 血の輪廻ロンド, Akumajō Dorakula X: Chi no Rinne Rondo?, lit. 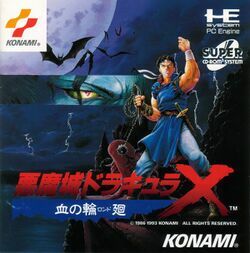 Demon Castle Dracula X: Rondo of Blood Resurrection) is a Japanese action-platform game developed by Konami for the PC Engine Super CD-ROM² system. The game was directed by Toru Hagihara. The game was released in Japan on October 29, 1993. It was the 10th installment in the Castlevania series, and the X in the title was specifically chosen to be ambiguous with the Roman numeral. The game was ported to the SNES as Castlevania: Dracula X, and to the PSP as Castlevania: The Dracula X Chronicles. The latter actually included two games: the first release of the Rondo of Blood with the official English title, as well as an enhanced port of Castlevania: Symphony of the Night, its direct sequel. The original version of Rondo of Blood was also released for the Wii's Virtual Console service in Japan in 2008 and worldwide in 2010. Taking place in 1792, Rondo of Blood is set in the fictional universe of the Castlevania series. The premise of the series is the eternal conflict between the vampire hunters of the Belmont clan and the immortal vampire Dracula. The protagonist is 19-year-old Richter Belmont (Jin Horikawa), heir to the whip Vampire Killer and Simon Belmont's direct descendant. He comes to the castle after his beloved Annette (Atsuko Honda) is kidnapped by Dracula's servant Shaft. Two times throughout the game, Dracula's trusty lieutenant, Death, attempts to stop Richter before he reaches Dracula. Along the way, Richter may attempt to rescue some other prisoners hidden away in the castle. This page was last edited on 15 October 2018, at 07:55.